Putnam – Theresa C. (Sarette) Dumas, 81 of David St, died Saturday, November 28, 2009 in Putnam. She was the loving wife of Ernest H. Dumas for 62 years. Born in New Haven, CT, she was the daughter of the late Henry and Eva (Goyette) Sarette. Theresa worked as an assembler for the former Idlewild Company. She also worked for the former Putnam Woolen Mill and the former Crown Lunch. She was a communicant of Saint Mary’s Church and a member of the Daughter’s of Isabella. She enjoyed playing Parcheesi and watching her children and grandchildren compete in sporting events. She was well liked in her neighborhood serving as a second mother to the youngsters there. 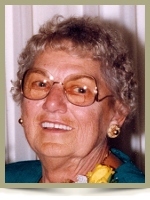 In addition to her husband, she is survived by three sons, Ronald Dumas of Jacksonville, FL., Arthur Dumas of Aurora, CO, and Glenn Dumas of Putnam; two daughters, Diane DiVincenzo and Joyce Dumas, both of Putnam; her sister, Jeannette Veilleux of Putnam; twelve grandchildren and ten great-grandchildren. Relatives and friends are invited to visit with Theresa’s family from 5:00 to 8:00 pm on Wednesday, December 2, 2009, in the Gilman Funeral Home, 104 Church Street, Putnam, CT. A gathering will begin at 9:30am Thursday, December 3, 2009 in the funeral home with a Funeral Mass of Christian Burial at 10:30am in Saint Mary Church of the Visitation, 218 Providence Street, Putnam, CT 06260. Burial will follow in Saint Mary Cemetery. I was so sorry to hear that Aunt Teresa passed away. of us were close enough to keep in touch. your loss.She was a wonderful woman.